Apple today seeded the fourth beta of an upcoming macOS High Sierra 10.13.5 update to developers, one week after seeding the third beta and more than a month after releasing the macOS High Sierra 10.13.4 update. The Messages on iCloud feature is designed to store your iMessages in iCloud for improved syncing. Right now, incoming iMessages are sent to all devices where you're signed into your Apple ID, but it's not true cloud-based syncing because your old messages don't show up on new devices nor does deleting a message remove it from all of your devices, both features enabled through Messages on iCloud. Messages on iCloud also allows your older iMessages and attachments to be stored in iCloud rather than on your iPhone, iPad or Mac, saving valuable storage space. The update also likely includes bug fixes and performance improvements for issues that weren't addressed in macOS High Sierra 10.13.4, but as Apple does not provide detailed release notes for macOS High Sierra beta updates, we may not know exactly what's included until the new software is provided to the public. 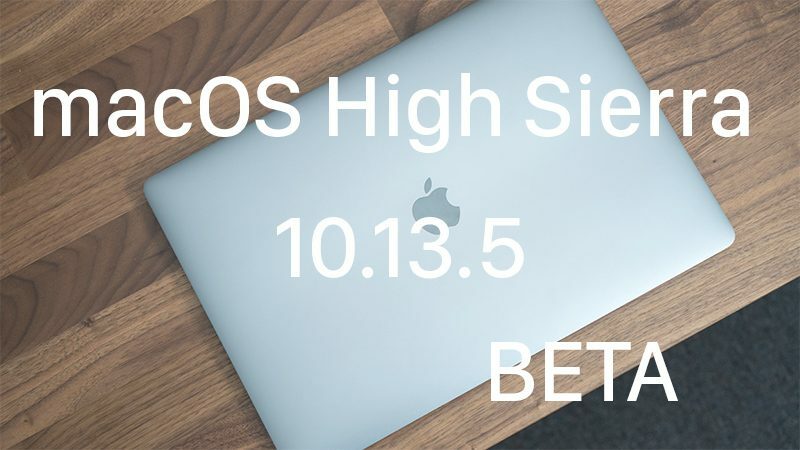 No major outward-facing changes were found in the first three betas of macOS High Sierra 10.13.5, but we'll update this post should any new features be found in the fourth. The previous update, macOS High Sierra 10.13.4, brought support for external graphics processors (eGPUs) along with Business Chat in Messages and several other bug fixes and smaller feature improvements. Update: Apple has made a new version of macOS High Sierra 10.13.5 available to public beta testers. Is HomeKit coming to MacOS? This is typically the magic number for me to think about trusting it on my workstations. Around the the 5th revision. I used to jump right into the newest OS, but it isn't worth it anymore. They don't do enough real world Q&A. For the last three major versions (10.10, 10.11, and 10.2) I have waited until September to update to the final revision (e.g 10.12.6) just before the new major OS version is released. Then I stay there until the next Sept......rinse, repeat. This way I (hopefully) get the most stable release of the current OS version, just before it's not current any more. Any third party hardware and software should have been updated and with Apple not really including "must-have" features in the brand new OS versions lately, this process has served me well. We've been living with HFS+ for 20 years. Another few months ain't gonna kill us. I'd rather it work rock solidly than deal with weird anomalies with my data, thanks. Hopefully the awful "blurry PDF" bug that exists since the release of High Sierra will be fixed by this update. It is really really annoying. I got out of the iOS beta when 11.3 went live. I so missed iMessage in the Cloud that I recently installed 11.4 on my phone and iPad. Was still hurting that the latest version of Mac OS beta didn't appear to have the feature. I guess they just added it based on this story. It is painful having to delete like 30 messages in the Mac app. Click the little X, click the delete confirmation, click the little X, click the delete confirmation, repeat 28 more times. If you don't want to take your hands off the keyboard, press command-D to confirm deletion. It used to be that you could skip deletion verification by pressing command-option-delete or option-click on the X, but that got removed with Messages in the Cloud. Did this bring back suppor for eGPU's running over TB2?